It occurred to me, while making this, that my Thanksgiving dinner was already pretty sweet. I had that beet salad (and beets are sugary) and a cranberry sauce I’ll tell you about in the next post. So this maple-coated butternut squash with apples started to concern me; but then I changed the recipe in one way: I added a healthy dash of cayenne pepper. And honestly? That did the trick. It gave the squash some heat and, along with the rosemary, thyme or sage that’s already part of the recipe, moved it more in a savory direction. 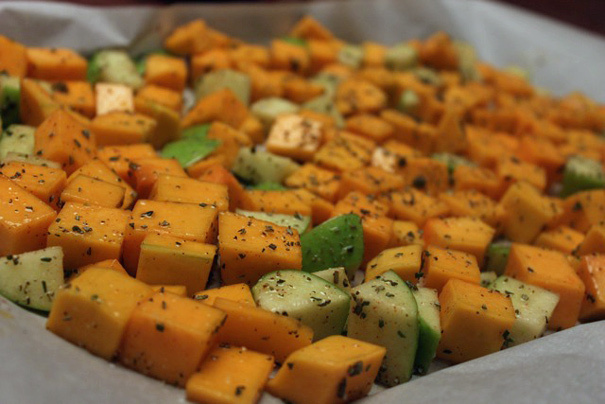 You may be wondering: “If I only have one oven, how do I roast the squash while I’m also roasting the turkey?” That’s a good question. Here’s what I did: I did the squash roasting first–it only takes 40 minutes–then I set the tray aside and after the turkey was done and we were ready for the entree, I popped the tray back into the oven to reheat it. No problemo. Pay attention to Molly’s directive not to crowd the tray. I would’ve done this on two trays, as she suggests, but I don’t have two racks in my oven (a problem!) so I did more at once than I should have. 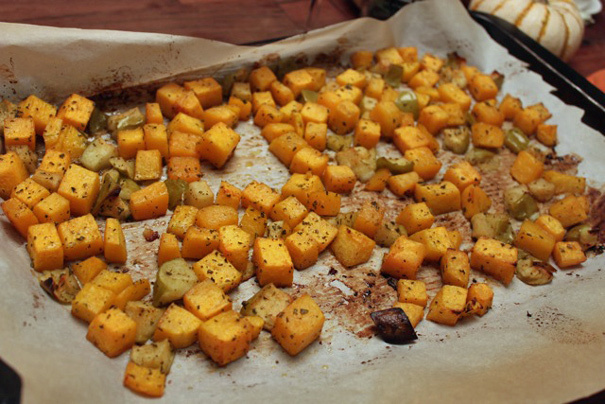 The result was that the squash and apples didn’t really caramelize; they mostly steamed. My solution was turn the temp up to 500 towards the end and that got things browner but not in the same way. Still, everyone loved this side. Follow the rules and people will love it even more. Position racks in the upper and lower thirds of the oven and heat to 400 degrees (375 degrees convection). If desired, line 2 heavy-duty rimmed baking sheets with parchment paper. 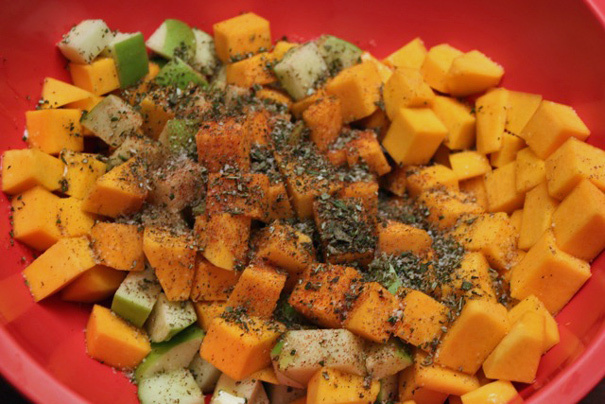 Combine the squash and apples in a large bowl and drizzle the butter, olive oil, and maple syrup over them. Season with the marjoram and salt and pepper and toss to coat. Transfer the mixture to the baking sheets, distributing it evenly and spreading it in a single layer. Slide the baking sheets into the oven and roast, turning the squash and apples with a metal spatula once or twice, until the squash is well caramelized on the outside and tender throughout and the apples are tender, about 40 minutes. Taste for salt and pepper, sprinkle with the nuts, if using, and serve hot or warm.